December 24, 1998: In just a few hours the Jolly Old Elf will brush the fireplace ash out of his beard, don his famous red suit, and begin the serious work of delivering presents all over the world. It's a job he's done in the same way for a long, long time, but times may be changing. As humans and space probes travel to other worlds, the possibility of Christmas on other planets can no longer be ignored, and the prospect of delivering presents throughout the solar system is, well, turning Santa's hair white. 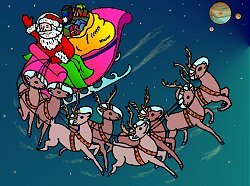 Right: Artist Duane Hilton's concept of Santa and his reindeer as they deliver Christmas presents to future space colonies. In an exclusive interview, Science@NASA visited Santa Claus at his secret North Pole workshop. He took a break from final preparations to talk about how he'll maintain his legendary delivery system as humankind inhabits other worlds. "The Moon won't be too much of a challenge," Santa told us. "I figure the lunar colonies will keep Earth time, so I'll just add them to my route. The reindeer will gripe about having to put on spacesuits, but we'll get used to it." "Mars is going to start to stretch us a bit. See, it takes 687 days to go around the Sun. That's about two of our Earth years. So every other year I'll have two Christmas runs to make, the Earth-Moon run and the Mars run. We'll really have to 'haul Rudolph,' as the reindeer are fond of saying. Fortunately, a Martian day is 37 minutes longer than an Earth day, so we can still do our usual overnight delivery. Some of the planets have much shorter days than Earth! ... Excuse me a moment." One of the senior elves was asking about overtime to complete a special batch of toys. "I worry about the elves," Santa continued. "They count on a slack period to fix the factory and retool for the next year. I'll have to hire more helpers if we're going to service the Moon and Mars, too." "Well, I've given them some thought", explained Santa. "Take Venus, for example. It's a tough environment - high temperatures, and a thick, choking carbon dioxide atmosphere. Plus, the clouds are made of sulfuric acid. Talk about air pollution. Venus circles the sun every 224 days, so Christmas will come about every eight Earth months. That's a little more often than we're used to here on Earth, but it'll be easy to deliver all the presents in one night. Venus's day is 243 times longer than ours. I'll have all the time in the world - their world - to deliver. Everyone gets their presents on the same day, no matter when I deliver. Ho, ho, ho!" "Now, the closest planet to the Sun is Mercury," he went on, wagging his finger in a professorial fashion. Santa really knew a lot about the solar system. "You'd think that Mercury would be the hottest planet, but Venus is actually a little warmer, on average, because of the greenhouse effect in its carbon dioxide atmosphere. That's not to say Mercury isn't hot -- it's scorching! Daytime temperatures reach 5000 degrees C. The appealing thing about Mercury, at least for the kids, is that the planet's year is just 88 Earth days long. Imagine that! Christmas every 88 days. It's a bit too often if you ask me, but that's gravity for you." "Jupiter's the big challenge. If we actually build colonies on that planet, I'll have less than 10 hours to deliver everything. Nine hours and 55 minutes, to be exact. The giant planet is 11 times wider than Earth, but it rotates more than twice as fast!" "Jupiter doesn't have a solid surface, so any future colonies will probably be suspended in the clouds. 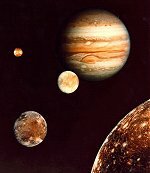 Jupiter's atmosphere is made of hydrogen, helium, methane, and ammonia. It's pretty toxic but not nearly as bad as Venus's atmosphere. We'll need special protective suits for both planets, which is bad news because the reindeer hate wearing clothes!" "In fact, I'm looking forward to Christmases on Jupiter every 12 years. I think I'll turn Europa, the third largest moon, into a branch office. It's entirely covered with ice, just like the North Pole here on Earth, so the elves would feel right at home." Santa paused again to initial some requisitions for spare parts for the sled. "Pluto... now that's the one that really interests me. It's the most distant planet by far, 39 times farther from the Sun than Earth. It takes 247 Earth years to go around the Sun just once. Think of it -- only one Christmas every 247 years! Plenty of time to retool between holidays. And the Plutonian day lasts six Earth days and 18 hours. I could really take my time delivering gifts. Not that it would take long anyway. Pluto's the tiniest planet in the solar system." "Pluto's got real possibilities," he warmed to his theme. "I say we've got to hurry up with planetary exploration. Mars tomorrow, then Jupiter and onward to Pluto! Once we get to Pluto, I might just set up shop there and the human race can keep my calendar. Christmas once every 247 years. That might make things a bit easier - I'm not as young as I once was...." Santa looked thoughtful. Christmas only once every 247 years? Was Santa serious? Suddenly an impish smile crossed his face. "Now how many children would stand for Christmas once every 247 years?" he asked with a twinkle in his eye. "I suppose we'll just have to keep doing it once a year as always." Just then Mrs. Claus quietly appeared from the kitchen and thrust a bag of cookies into our hands. Sign up for our EXPRESS SCIENCE NEWS delivery "You really must go, dears," she said. "He has a long night ahead of him, after all." We went to the front door and bade our farewells. The stars shone brightly in the clear Arctic sky. As we turned to our dog sleds to begin our journey home, we heard Santa's voice boom from within: "Merry Christmas to all, and to all a good night!"